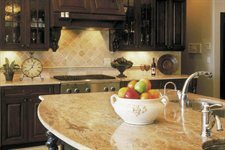 At Houston Granite and Flooring, we understand that an amazing design is the foundation of your new construction or remodeling project. What look do you want to achieve? What feeling do you want to have when you step into the room? Well help you answer these questions and then create the design that will make it happen. Of course, a crucial element of our success is our crew of master craftspeople artisans who are deeply passionate about their work. We have the skill, experience and drive for perfection that will turn your dream into reality. We have been providing elite stone work and flooring to Katy, Memorial, Kingwood, River Oaks, Conroe, Galleria, Sugarland, and everywhere in between for over 12 years. State of the-art machinery is used for fabrication. We have over 20 select stone yards with over 1000 imported Granite and Quartz are available. Caesarstone, Zodiac, Silestone, Granite, Natural Stone Flooring. Back Splashes from Porcelain, Tumbled Marble, to Glass Mosaic.....and everything in between.. Prices are available upon request. Houston Granite and Flooring.....We capture your dream and make it a reality!